The small amulet is in the shape of a pendant, missing its bottom part, measures 21mm wide, 4 mm thick and its preserved length is 16 mm. A loop on top allowed it to be strung and hung on the neck. The raised decoration displays a cartouche – an oval frame surrounding Egyptian hieroglyphics bearing the name of the Egyptian ruler. Above the oval framing is the symbol of an eye, and to its right are remnants of yet another hieroglyphic symbol depicting a cobra of which parts of the head and tail are preserved. 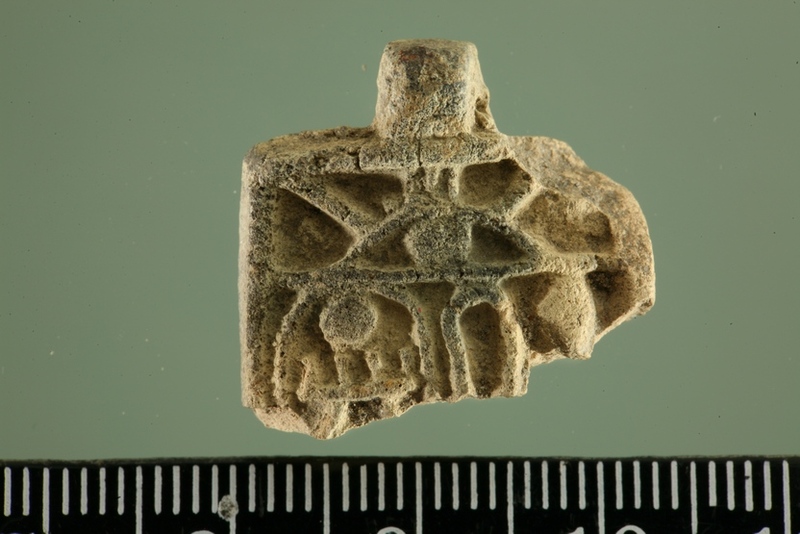 While Egyptian scarabs bearing the name of Thutmose III have previously been discovered in Jerusalem, this represents the first time his name has been found in Jerusalem adorning an amulet. “Objects bearing the name of Thutmose III continued to be produced in Egypt long after the time of his reign, reflecting the significance and lasting impression of this king,” said Barkay. The press release includes more information. The story is also reported by The Times of Israel, Jerusalem Post, and others. A higher-res image of the photo above may be found here.